Description: Belmar is Lakewood, Colorado’s new downtown neighborhood. As part of the 100-acre Villa Italia Brownfield redevelopment, the masterplan was devised to implement the signature green space of the neighborhood. The 2- acre urban park provides a peaceful park setting within a vibrant retail and residential community. 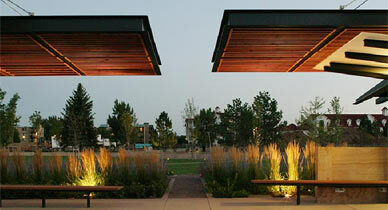 The design marries traditional park planning principles and a contemporary detail vocabulary. Sustainable design goals were accomplished and the park is a model of the modern urban oasis.